So how much force is generated in a check? Using a mathematical formula, we can discover how much energy is expended in an open ice hit. Let's say it's late in the third period at the San Jose Arena with the Sharks ahead of the Philadelphia Flyers by one goal. Flyers captain Eric Lindros, deep in his team's zone, finds himself alone with the puck, facing a sea of ice. There is only one man who could possibly stop him from breaking away at the goalkeeper--Sharks forward Jeff Friesen. As Lindros goes into in high gear to tie the game, Friesen decides not to lay back and play it safe, but to rush forward at full speed and perhaps take out the Flyer forward by hitting him straight on. With Lindros weighing in at 6-4, 230 lbs. and Friesen at 6-0, 200 lbs., the fans may want to prepare for a small earthquake in the Arena. Just how much energy results from this collision? This calculator requires Netscape 3.0 or higher. The amount of energy produced from the collision is equal to Joules. This collision produces enough energy to shoot a puck feet. The puck would initially be moving at a speed of mph. The stopping force is pounds. This is enough energy to light a 60 watt lightbulb for seconds. 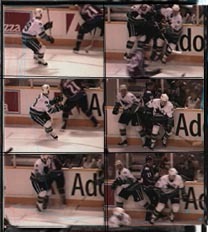 This sequence shows a check along the boards, which is much more common than an open ice hit. The math is similar but you'd need to factor in the boards. The energy comes out in a metric unit called a "joule". A joule is not a lot of energy. It's about the amount of energy you'd use to lift an apple to the height of your waist (1 meter). According to Newton's third law -- for every action there is an equal and opposite reaction -- each player must experience the same force. To calculate the time a lightbulb burns, all you need to know is that when you use one joule per second, that's one watt. We divided the final energy by 60 to calculate the time in seconds.